Motorized screen with automatic ceiling closure with or without Tab Tensioning System. Available in sizes through 16' wide. The Signature Series offers the clean appearance of a ceiling-recessed screen in virtually any size, with any viewing surface. Ideal for boardrooms and meeting rooms. Signature’s independently motorized aluminum ceiling closure disappears into the case when the screen is lowered, for a perfectly unobstructed view. Hinges are completely concealed, and the closure is supported along its entire length—no sag is possible. 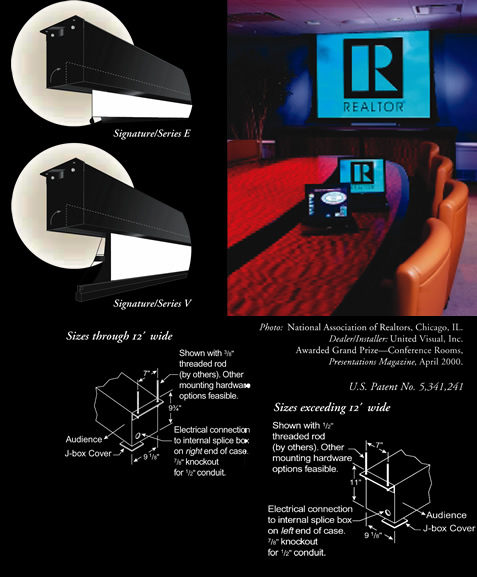 These exclusive features mean that the Signature Series is the best concealed projection screen you’ve ever seen. Screen can be operated from any remote position. The Signature/Series V combines the clean appearance of a ceiling-recessed screen with the unparalleled performance of Draper’s Tab Tensioning System to hold the surface taut and wrinkle-free. The flat surface guarantees perfect convergence for perfect image quality with today’s demanding video and data projectors. All surfaces are bordered in black. Now you have the option of a conventional textile-backed viewing surface without tab tensioning but with all the benefits of the original Signature design. With the addition of the Signature/Series E, no other manufacturer gives you this wide range of fabrics to choose from, plus a patented ceiling closure that disappears into the case. The classic Signature screen. Automatic ceiling closure opens into case. Features choice of M1300, M2500, or Cineflex for rear projection, all with Draper’s Tab Tensioning System. Now in larger sizes - through 16' wide (Sizes larger than 12' x 12' have alternate case construction and dimensions: refer to line drawings above, right). M2500 not available in 12' x 12', or larger than 10' 6" x 14' AV format or 200" diagonal NTSC video format sizes. The Signature is now available with textile-backed viewing surfaces and an automatic ceiling closure. Fiberglass matt white, glass beaded, optional Panamax, and AT1200 acoustically transparent surfaces all hang suitably flat without tab tensioning. Sizes through 16' wide (Sizes larger than 12' x 12' have alternate case construction and dimensions: refer to drawings above, right). Extra Drop, Series V - Up to ... overall height, either white or black (White is standard). Extra drop will increase the overall length of the case: contact Draper if this dimension is critical. Extra Drop, Series E - Up to ... overall height, either white or black (White is standard for Series E in AV format; black for all other formats).